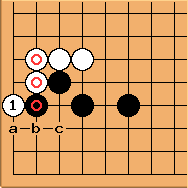 After the 4-4 point diagonal attachment joseki, White can hane connect giving this shape (marked stones show the hane-connect). Now White can play as a big endgame move. The question is whether Black can reply at a or not.